Munetsugu’s (宗次) given name was Koyama Sobei (固山宗兵衛) and he was born in 1802 in Shirakawa province in Oshu Prefecture. He was also known as Issensai (一専齋) or Seiryôsai (精良齋). He was the younger brother of Koyama Munehira (固山宗平) and Koyama Munetoshi (固山宗俊). He was a member of the Katô Tsunahide (加藤綱英) Mon and he also studied sword making under Tsunahide’s (綱英) younger brother Chounsai Tsunatoshi (長運斎綱俊). Later Munetsugu (宗次) went to Edo and worked as a retained swordsmith of Lord Matsudaira of the Kuwana family. In the second year of Koka (1845) he received the title of Bizen no Suke (備前の介). 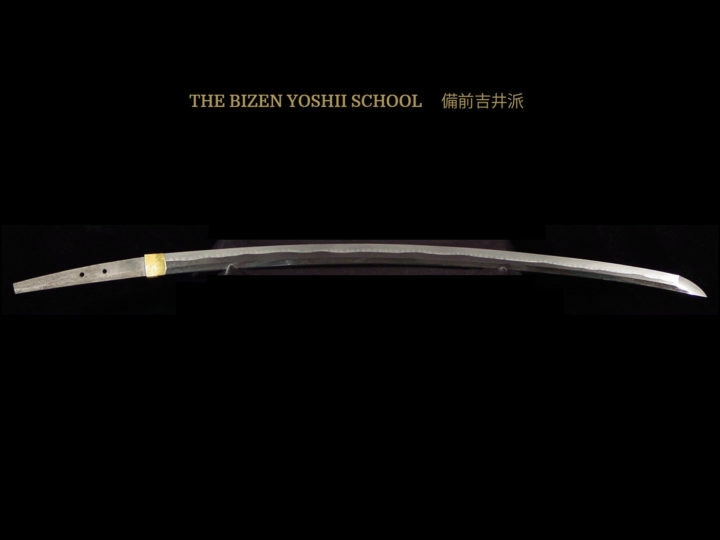 It is believed that he was given this title because of his expertise in producing swords in the Bizen tradition. 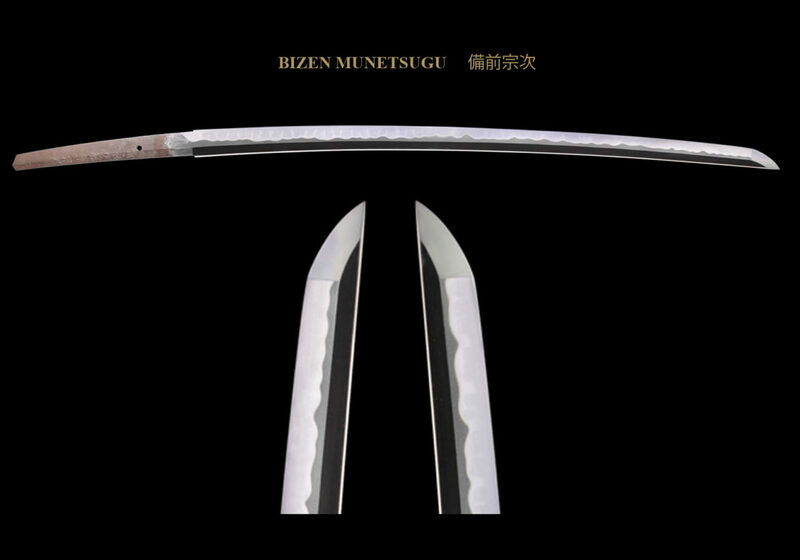 True to the Bizen tradition, most of his blades display a chôji-gunome midare hamon done in nioi deki. There are also some works that are made in suguha to emulate the Ko-Aoe style of workmanship. 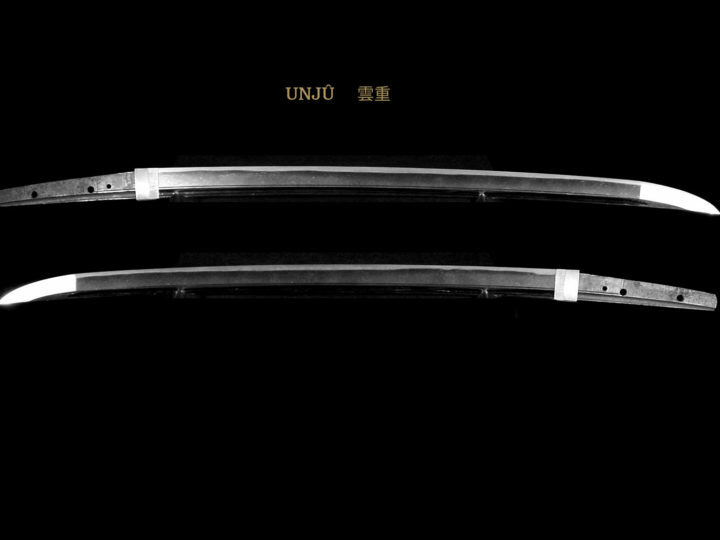 He produced many fine blades from around 1830 up until the beginning of Meiji. His works done in the Tenpo era (1830-1845) are considered some of his best. Having worked in both Owari province and Kuwana, he frequently traveled back and forth eventually settling down in the Yotsuya Samon-cho area of Edo. It appears that Munetsugu (宗次) collaborated with the Yamada family of professional sword testers, especially Yamada Yoshitoshi and Yamada Asauemon Yoshimasa, the head of the family. As the clan smith of the Kuwana clan, the Han samurai often subjected his blades to cutting tests. For that reason, there are many of his blades surviving with cutting tests. Many of these tests seem to have taken place at Senju where there was a famous execution ground or Denma-cho prison. Most of these tests seem to have taken place in the Tenpo era when Munetsugu (宗次) was at his peak in his thirties. 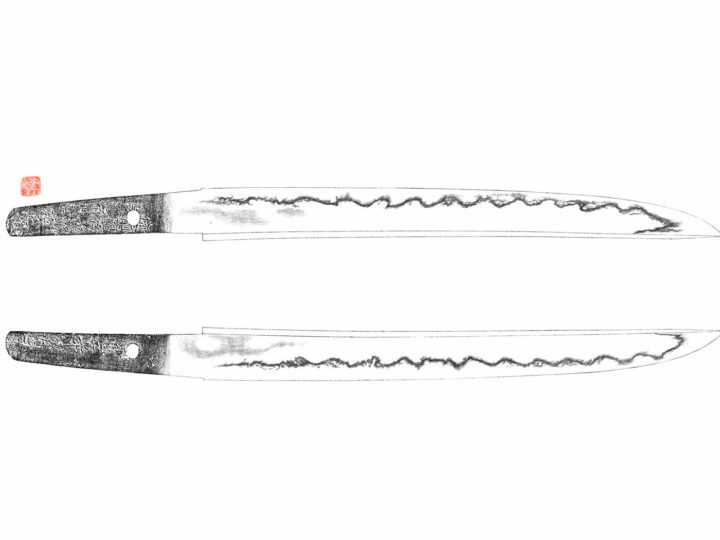 The kantei blade for this month has one such cutting test stating that it took place at Senjo Ryosha. 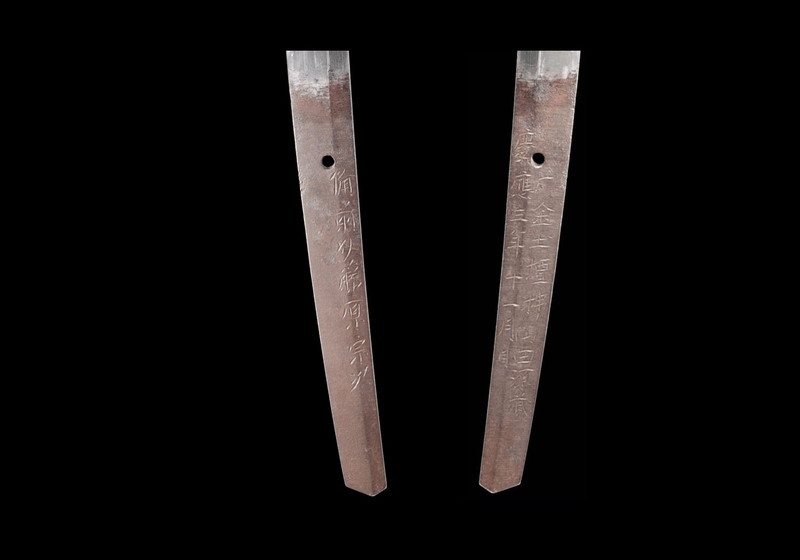 The number of blades with cutting tests shows that, as with his contemporary, Kiyomaro (清麿), Munetsugu’s (宗次) talent and reputation were well respected and understood even while he was alive. In fact swords signed by the well-known faker, Kajihei include Koyama Munetsugu (固山宗次) counterfeits. Making fakes while the artist is still alive can be construed to be a very high level of flattery, I suppose. Munetsugu (宗次) was considered to be the master of the Bizen Den Ichimonji style of choji midare during the early part of the Shinshinto period. Both the ji and the ha are clear and distinct in his works, and he was probably the best of the smiths at that time tempering blades in the Bizen Den style. Munetsugu (宗次) died in 1872 at the age of 70 and is rated at least as highly as the other important smiths of the Shinshinto era such as Masahide (水心子正秀), Naotane (直胤), Unjusai Korekazu (運運壽是一) and Chounsai Tsunatoshi (長運斎綱俊), especially in Bizen den works. His students and associates include his brothers, Munehira (宗平) and Munetoshi (宗俊). Also included are Kubota Muneaki (久保田宗明), and Seisôsai Muneari (精壮斎宗有). SUGATA: Shinogi zukuri katana and wakizashi is the most common. 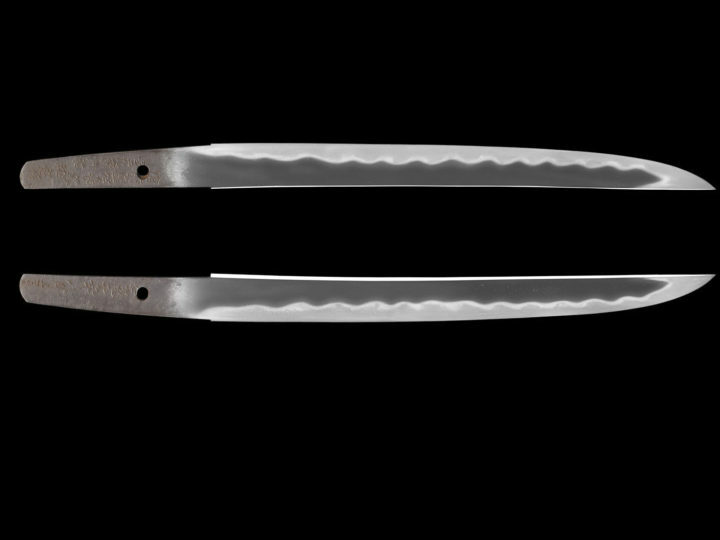 The sori is often robust with the blade having a thick kabana. The kissaki is usually chu-kissaki and those with an extended style bôshi are rare. Generally, his blades are iori-mune. JITETSU: The jitetsu is excellent being a very tight itame in the muji style. There are also times when he made an o-itame hada with some mokume. In all cases his jitetsu is bright and clear. HAMON: He is most famous for his Bizen choji-midare hamon, which he made throughout his career from beginning to end. The hamon is nioi based. Occasionally there is a different style hamon such as wide suguha reminiscent of the ko-Aoe school, but this is the exception as during his life he worked to revive the Ichimonji style on Bizen choji-midare hamon. BÔSHI: The bôshi continues the shape of the hamon with a short kaeri. Generally, his bôshi are referred to as being midare-komi with a short turn back. HORIMONO: Hi are seen but rarely and other styles of carvings are exceedingly rare. NAKAGO: His nakago shape and yasuremei are interesting in their variety. Generally, his nakago will be long and shaped very well in balance with the blade. His jiri was generally iriyama-gata, but there were also kengo and kuri-jiri and shaped ones. His kesho changed, as he got older. He did sujikai and kesho, and o-sujikai kesho early on and changed to kiri later.